Welcome to the official website for the Strategic Environmental Assessment (SEA) for Shale Gas Development in South Africa. The website provides the general public with the opportunity to register as stakeholders; conveys the latest information and outputs of the assessment process for review and comments; and describes the opportunities for how stakeholders can engage further in the assessment over the 24 month SEA process. The website will also serve as a ‘knowledge portal’ for authors and experts comprising the assessment team, by providing them with a virtual library of all relevant journal papers, reports and spatial data which will be used during SEA process. The potential future economic and energy security benefits of a large resource of natural gas in South Africa could be substantial; as are both the positive and negative social and environmental issues of establishing a domestic gas industry in the Karoo region. South African government, through Cabinet and various other decision-making institutions, has made high-level public commitments to shale gas exploration. If the exploration phase occurs and yields successful hydrocarbon deposits and gas-flow regimes, it is a reasonable assumption that Government would consider development of those resources at a significant scale. DEA, along with other relevant authorities, need to be in a position to make decisions relevant to that choice in a timely and responsible fashion. Although a substantial amount is already known about shale gas development and its consequences based on experience from around the world, very little is known about the industry in the South African context, which makes information very hard for decision-makers and stakeholders to evaluate. In order to make well-informed decisions and have some hope that decisions will be broadly accepted by stakeholders as credible and legitimate, a structured and transparent process of information sharing and scientific assessment needs to take place. If shale gas development occurs, it is guided by evidence-based policies, robust regulatory frameworks and capacitated institutions in a manner that is ethical, responsible and transparent. 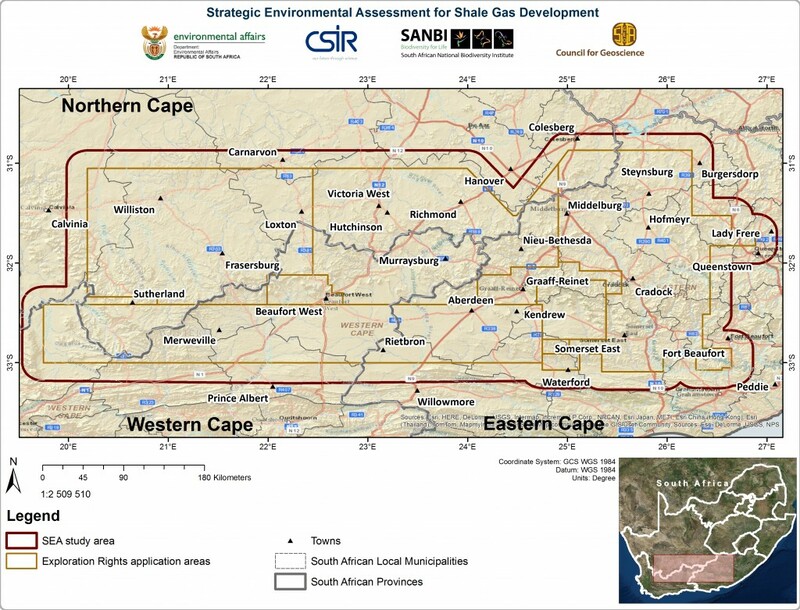 To provide an integrated assessment and decision-making framework to enable South Africa to establish effective policy, legislation and sustainability conditions under which shale gas development could occur. Develop policy options and guidelines for site specific assessments to be implemented if Environmental Authorisation applications for shale gas development are submitted to any relevant authority. CSIR is one of the leading scientific and technology research, development and implementation councils in Africa. Constituted by Scientific Research Council Act (Act 46 of 1988, as amended by Act 71 of 1990) as a science council, the CSIR undertakes directed and multidisciplinary research, technological innovation as well as industrial and scientific development to improve the quality of life of the country’s people. SANBI conducts research, as well as monitors and reports on the state of biodiversity in South Africa. The institute provides knowledge and information, planning and policy advice, and best-practice management models in partnership with stakeholders. CGS is a South African National Science Council which aims to champion earth science solutions. The aim of CGS to provide expert earth-science information and services to improve the management of natural resources and the environment for a better quality of life for all. 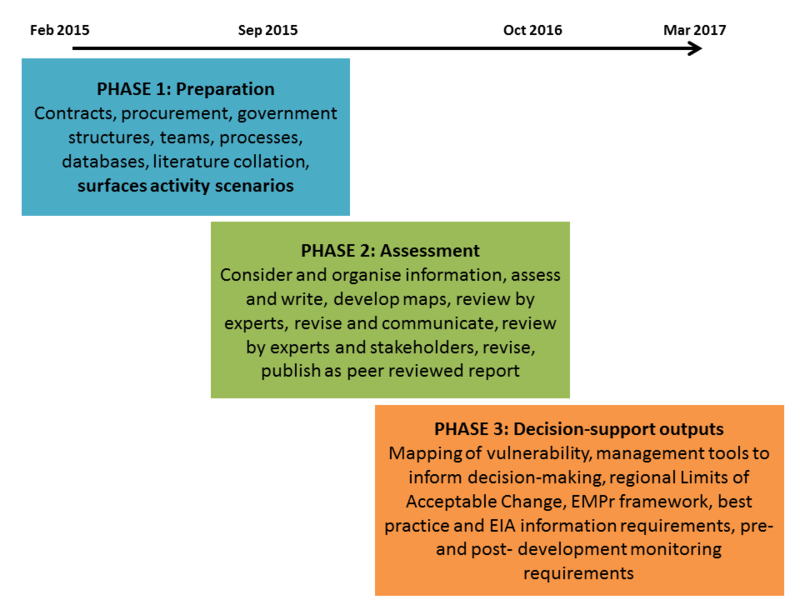 The primary purpose of this phase of the assessment is to set-up and implement all project management structures, convene the project governance groups, recruit authors and experts to the Multi-Author Teams and release a Draft Approach Report at the end of Phase 1 for expert review. This document will also be available to the public on the website. This will be the component of the study where the actual scientific assessment by the Multi-Author teams for all Strategic Issues takes place. At the end of Phase 2 Draft and Final SEA reports will be released for expert and public review. The extent of the study area was informed by the areas currently under applications for Explorations Rights (by the operators Shell, Bundu, Falcon). In October 2014, the DMR Minister was quoted in parliament as saying “there are currently five (5) applications to explore for shale gas in the Karoo area. Applications were received from Falcon (x1), Bundu (x1) and Shell (x3). The applications have not been assessed and therefore no applications have been approved or refused”. It was acknowledged that additional Technical Cooperation Permit applications have been submitted to the Petroleum Agency South Africa (PASA) in the last 4 years for desktop studies, but that many of these have expired. Considering that PASA’s sweet spot reserve estimates are succinctly aligned with the current Exploration Right applications from Falcon, Bundu and Shell, this region represents the obvious area to initiate the first pass SEA process. The official shapefiles from PASA delineating the existing Exploration Rights applications were used to define the study area (with a 20 km buffer around existing Exploration Rights application areas). The study area includes 27 local municipalities and encompasses 171 811 km². Copyright (c) CSIR 2016. All rights to the intellectual property and / or contents of this website remain vested in the CSIR. The content is intended solely for use by the SEASGD team and may not be used, in whole or in part, in the preparation of specifications for any tender documents or calls for quotations and / or counter proposals from similar service providers without the express written permission of the CSIR.